Got You Some Holiday Market is a blowout of New Orleans-inspired food, music and original crafts from 2 p.m. to 7 p.m. on Sunday, December 16, 2018, at Marz Community Brewing Company, 3630 S. Iron St., Chicago. The Herbsaint Band will stomp out traditional New Orleans jazz and Dixieland favorites while Chef Chris Reed of Rice Table takes over the tap room kitchen to offer a curated Cajun menu. 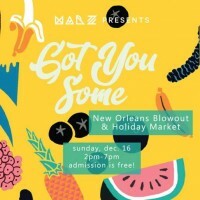 Veejay Steve Marquette has lined up special southern-fried eye candy and tunes, and Marz plans a limited edition beer release in conjunction with the event. Vendors at the holiday craft market include Ebimera Vines, Marine Tempels, International Anthem Recording Co., Ifé Jewelry, Experimental Sound Studio, Project Fire Glasswork, Avrocromy, Fracture Goods, Law of Ice, GnarWare Workshop and more. Proceeds will benefit the Green Star Movement, a Bridgeport-based non-profit that works to beautify and support the creation of public art in the neighborhood.